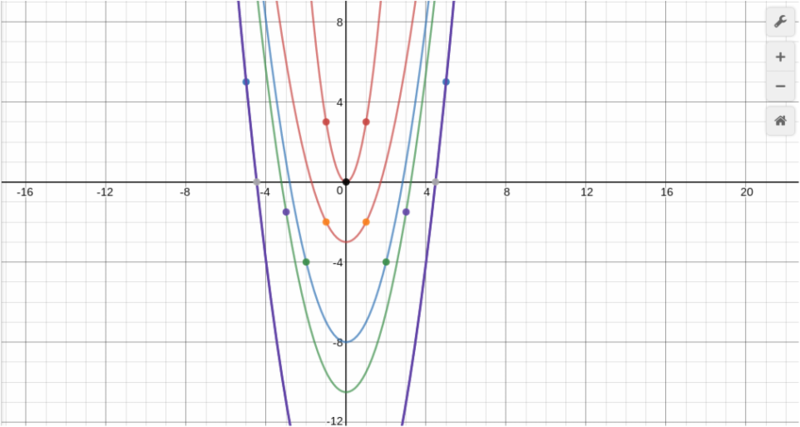 In this activity, we learned how to use parabolas to solve different problems in DESMOS. During our activity, we practiced using simple equations like y = (x+3)^2 to move a parabola where we needed it to go. Moving it up, down, left, right and making it wider and skinnier were other problems that we encountered as we dove deeper into the world of parabolas on DESMOS. ​Our first problem that we worked on in DESMOS was the basketball challenge. When working on this, we each had to try and predict if a basketball would either go inside the hoop, or it would bounce out. As I was working on this, I was constantly realizing how difficult it became in the beginning when I didn't fully understand parabolas or wasn't familiar with them. After some practicing, this became easier and I was able to understand how a parabola would help me determine or make a prediction. For the second one, we had to each play a game called "Match My Parabola, which is where I was able to get more understanding about parabolas from. This became easier, as I used some vocabulary (which I had learned in class) that would help me guess what parabola I had to match with my partner. There were various times where we would try and guess each other's parabola's and we would end up choosing the one our partner chose or our partner would choose what we chose. This led to reviewing the round and figuring out when it was that we made a mistake and how we can fix this. Thanks to this activity, I got a bigger picture of what a parabola can look like, it's different angles and what kind of vocabulary we are supposed to use when we are talking about a parabola. For this activity, we had to create parabolas to match the vertex points that were given to us automatically. The way we had to challenge ourselves was to connect the parabola with it's indicated color points. While working on this, I realized that you needed to go above and below the numbers we would usually use when we started working with parabolas. Since I only knew the basics with parabolas and how to graph them, this became challenging and fun, to the point where I wouldn't get frustrated if I didn't get it right the first time. I had to push myself to change each number and try to create a different kind of parabola in each challenge. For the last activity, we were instructed to create a parabola that will let us catch all the stars that were shown on the graph. As we worked on this, many people tried doing their parabolas different directions, and it would guide them. Some people created their parabola upside down, and some did different shaped parabolas. After some people realized how hard it will be to do this, they realized it would be easier if they created various parabolas to figure out each challenge. With a different problem came a new challenge. It would become harder and harder, but I pushed myself to try and figure them out, step by step, by applying all the different terms I had learned throughout the week. A time when I felt like I had to work on it step by step was when I had figured out half of the problem, and needed the other half. I was close to catching all the stars (there were four) and I had caught 3 stars already. I realized, thanks to Luz and Ashley's help, that I just needed to extend the restrictions (when the parabola was cut off, as you can see below) and move the parabola one to the left and I was able to catch all four stars. Doing DESMOS showed me a different kind of problem that I could encounter when working in Math. It showed me how a parabola can me manipulated in order to get the points you might need in a graph or a certain problem. One thing that I could have worked on was I could have challenged myself to finish a certain problem a different way than how I had figured it out in the beginning. Overall, I think it was fun and challenging and I would do it again if I had the time. I feel like I did well in this problem. I felt confident working every day to figure out a new challenge with my teammates. I think one improvement I would work on is that I am not going to ask my teammates if they figured something out and then copy them. I am going to try and figure it out by myself before I ask my teammates what they did, and compare both parabolas with each other. There were times when I felt proud. One day, we were working on a challenging problem, and I felt confident in myself that I could do it, and I was able to get all the parabolas in the points. When I did, I was able to help out my group and show them how I was able to work on the problem and figure out the challenge. From the goals I put for myself in the beginning of the semester, I feel like I overcame most of them. The goals that I overcame were 1. Turning work in on time, 2. Being perseverance during a hard problem, 3. Taking notes during lectures and discussions, and 4. Inviting people into conversations. I was able to talk to my group, ask more questions and feel more confident with the problem we were working on in class. Overall, I think I deserve an A+ for my DESMOS work. Thalia gave me the advice to fix one of my auto corrects from one of my activities. Instead of "start", I wrote "stars" thanks to her realizing my mistake. Thalia also told me to include the one activity I had forgotten about which was "activity four." Sarina gave the feedback to wite a specific moment in activity five when, step by step, I had to figure out how to solve the problem. Sarina also told me to include the goal I had written for myself in the beginning of the semester and how I have improved from then to now.